Consumers have been shifting from mechanical gadgets to electronic ones for decades. It's time for our electrical outlets to get with the program. 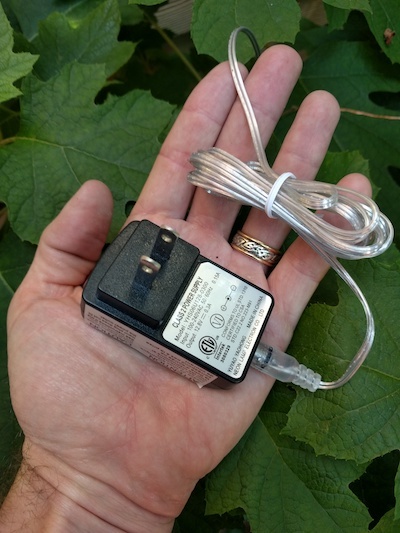 When my string of garden lights arrived in the mail last week, they came with a surprising attachment: a power transformer. Also known as a "brick" or "wall wart", these small black blocks have been proliferating in our home outlets for 35 years. Blame the digital revolution for the change -- electric lighting is one of the last dominoes to fall. Despite all these new gadgets, our wall sockets still use a system of alternating current designed in the 1880s. This system was built to make it easy to send electricity from power plants to homes many miles away. High voltage alternating current is great for industrial era technology -- it powers incandescent light bulbs, toasters, electric ovens, fans and hair dryers. Big physical things with motors and gears love the kind of power that surges from your wall sockets. But computers and other home electronics? Not so much. Their transistors and logic gates hate the undulating drift of alternating current that rises up and down like the ocean on a windy day. Electronics' delicate silicon layers are destroyed by the high voltage inside your walls. Bypass that "brick" transformer to send your home's 110 volts AC right into your laptop, and you'll hear a loud zap, smell smoke and end up with a charred circuit board that looks like it has been struck by lightning. Same goes for your cell phone, internet router, or your flat panel TV. That's why we need the dozens of wall warts hogging up the space on our power strips. They convert the old-fashioned power utilities deliver into the low voltage direct current that electronic devices demand. The proliferation of wall warts is a direct consequence of Edison losing this battle. These transformers exist not only at the end of cords that charge electronics, but hidden inside refrigerators and flat-panel televisions. They are everywhere. Such circuits are even hidden in the base of digital LED light bulbs, the modern descendants of the bulbs Edison and Westinghouse used in the 1880s. Because LEDs are just glowing silicon circuits, they require direct current, too. Much of the guts of these LED bulbs are actually built-in transformers (or similar circuits called rectifiers) which are essentially a built-in wall wart. Was the standardization on AC power a huge mistake? There are certainly negative consequences. When you feel a wall wart is warm to the touch, what you are feeling is waste. That warmth is caused by the inefficiency of converting AC to DC. The energy wasted isn't much compared to that used by your refrigerator or driving to work, but it's still waste. Plus, all those wall warts eventually end up in a landfill once they reach their end of life. Solar power adds another dimension to the conflict with legacy infrastructure. The photovoltaic cells in solar panels are DC-generating electronic circuits, kind of like a LED light bulb in reverse. Solar-generated DC must be converted with an inverter to AC so it is compatible with home outlets. Then it has to be converted right back to DC by a wall wart so you can charge your cell phone. That's nuts! Nobody is suggesting that we scrap our 130 year old AC electrical grid for the kind of DC transmission standard advocated by Edison. The simple and obvious solution is to convert AC power to DC power where utility service enters the home. Any power generated by home solar panels would not have to be converted to AC. Power would need to be converted just once using a single transformer that can be designed for maximum efficiency. A few home AC outlets could still exist to power legacy devices like refrigerators and microwaves, much like the atypical 220V AC outlet exists today for high power appliances like clothes dryers. To be clear, this change cannot happen overnight. New standards need to be adopted and existing homes rewired, a transformation that will undoubtedly take decades. The end result will be a fusion of the rival systems advocated by Edison and Westinghouse 130 years ago. When it arrives, waste will be less, lives will be simpler, the tyranny of the wall wart will finally be at an end.